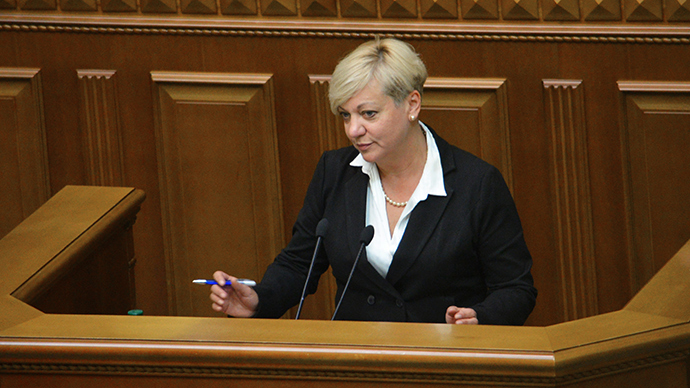 Ukraine’s economic recession has hit its bottom and the government is expecting gradual recovery starting from the second quarter of 2015, according to the head of Ukraine’s National Bank Valeria Gontareva. The country’s economic recovery is primarily expected due to the positive impact of net exports and capacity utilization, the National Bank of Ukraine quoted Valeria Gontareva as saying during a speech at a symposium in Kiev on Friday. Recovery in consumer and investment demand are also expected. The Bank claims the overall decline in real GDP will be 7.5 percent in annual terms in 2015, predicting at the same time the resumption of GDP growth by 3 percent for 2016. "We’ve already passed the point of no return in 2014 which became critical for both the country and the Ukrainian people,” Gontareva said. The financial account surplus in 2015-2016 will be achieved through significant volumes of official external financing and the expected conversion of sovereign and quasi-sovereign redemptions, the head of National Bank said. Along with the IMF financing this should help to restore international reserves to $18 billion, which would cover more than 3 months of future imports, according to Gontareva. Ukraine’s industrial output shrunk by 10.7 percent last year, compared with a 4.7 percent decline in 2013 and a 0.5 percent fall in 2012. The country’s industrial downturn for 2015 is expected to hit 5.5 percent in 2015, according to IMF forecasts. The fund also forecasts a slowdown in the real GDP of Ukraine from a 6.8 percent drop in 2014 to 5.5 percent in 2015. Meanwhile, the statement by Ukraine National Bank head comes the day Kiev is hosting its first Ukraine –EU summit since the ousting of President Viktor Yanukovich last year. The two sides will discuss Ukraine’s progress in implementing reforms, the EU-Ukraine free trade agreement, and prospects for visa-free travel to the EU, according to the Kyivpost. However, while Kiev and European officials are discussing the opportunities and the future of the country, some experts believe Ukraine poses the biggest and most dangerous threat to the future of the EU. Wolfgang Munchau, a columnist for the Financial Times, wrote on Sunday that even a Grexit would be not such a big loss for the EU as the failure to solve the issue with Ukraine.